Thus far, our series has focused on getting new players up to speed with the Star Trek Customizable Card Game through playing with, and customizing, the available starter decks. Eventually, however, you'll want to build a deck that's all your own. This and the next three installments of "Into the Final Frontier" will take you step by step through the deck building process. By the end of Part 8 of this series, we'll have a fully playable deck in hand. While there is no absolute order in which one must build a deck, choosing a headquarters is one logical place to begin. Your headquarters mission is crucial to the rest of your deck design, because to a great degree it determines which personnel, ship, event, and interrupt cards you will be able to use in your deck. As you know from the sample game presented in part 2 of this series, and from playing your own games with starter decks or the downloadable sample deck, you play your ships, personnel, and equipment cards at your headquarters mission. Each headquarters allows a certain subset of personnel and ship cards to come into play. So far, you may play any equipment card at any headquarters mission, but many event and interrupt cards are keyed to the affiliations (or headquarters-reporting icons) on your personnel cards. Therefore, your choice of a headquarters both enables and constrains your other deck building choices. Before we start our tour of the headquarters, there is one additional thing you need to be sure to understand. Most of the headquarters are keyed to specific affiliations and their icons: Romulus goes with the Romulans, Bajor goes with the Bajorans, and so on. Affiliation icons are located in the upper left-hand corner of personnel and ship cards. The nine affiliations currently available are Bajoran, Borg, Cardassian, Dominion, Federation, Ferengi, Klingon, Romulan, and Starfleet (there are also Non-Aligned cards, but these report to almost any headquarters). Some of the headquarters, however, are keyed not to affiliations, but to special reporting icons that appear on the personnel and ship cards. These icons reside to the left of the box where skills (personnel cards) and game text (personnel or ship cards) are listed, in the second position from the top of the icon column. The special reporting icons currently appearing on cards are Deep Space Nine, Earth, the Next Generation, the Maquis, Terok Nor, the Original Series, and Voyager. When choosing a headquarters, you need to take both the affiliation and the special reporting icon, if any, into account. Let's take a look, then, at each of the headquarters missions currently in print. Athos IV (Maquis Base). Athos IV is an uncommon card from the Energize expansion. You may play cards with the Maquis reporting icon, Non-Aligned cards, Federation Treachery personnel, and equipment cards at Athos IV. In the Deep Space Nine television series, the Maquis are a group of "terrorists" opposed to the Federation's diplomatic handover of a large number of planetary systems to the Cardassians. Many members of the Maquis were current or former Starfleet officers who disagreed with the Federation's policies and instigated a "guerilla" war against the Cardassians. Accordingly, the Maquis engage in both combat and subterfuge. On the combat front, Maquis personnel tend to have average Strength, and their ships tend to have average Weapons and Shields. They simply don't stand out as a powerhouse. If you're willing to commit the resources to beefing them up, however - whether by using hand weapons like the Starfleet Type-2 Phaser or by teaming ships together using Amaros (Earnest Vanguard) - you can reap significant rewards. If you assemble a little two-ship Maquis armada that includes the Guingouin, you can score 10 points for winning an engagement (ship battle). Your other ship in that little armada is quite likely to be a Maquis Raider, in which case you also force your opponent to place a personnel from the losing ship on top of his or her draw deck. The Maquis Raiders' ability to bounce personnel off a ship and back to the draw deck points to a second Maquis strength: sabotage. In game terms, that means denying your opponent access to resources that they really need in order to complete their missions. The popular event Biogenic Weapon can temporarily deny your opponent the ability to even attempt one of their missions. Defend Our People bounces a random card from your opponent's hand back to his or her deck - and if you're willing to sacrifice personnel, you can play the event over and over again. Perhaps the strongest card in the Maquis arsenal, though, is Organized Terrorist Activities. You need five points to spend in order to activate the card's abilities, but when you do, your opponent temporarily loses his or her hand and loses a card of your choice for the remainder of the game. Bajor (Gift of the Prophets). 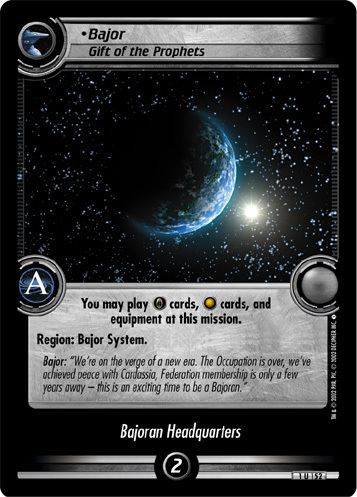 Bajor is an uncommon card from the Second Edition Premiere set. You may play Bajoran cards, Non-Aligned cards, and equipment cards at Bajor. The scrappy Bajorans are known in the Star Trek universe as passionate freedom fighters due to the long Cardassian occupation of Bajor. That occupation gave rise to the Bajoran Resistance movement, and some Star Trek CCG Bajoran personnel bear the Bajoran Resistance keyword. Such personnel, and the events that reference the Bajoran Resistance keyword, tend to be rewarded for combat (personnel battle) and are good at improvising with limited resources. The event Just Like Old Times, for example, allows your Bajoran Resistance personnel to begin combat; if they win, you score 15 points. The interrupt Natural Instincts grants your Bajoran Resistance personnel a skill that they don't already have. On the other hand, the Bajorans are also a deeply religious people, with a strong sense of divine destiny and faith-inspired community. The Bajorans can access a number of cards with religious themes, but the most characteristic of all Bajoran themes is resurrection - the reuse of previously expended resources. 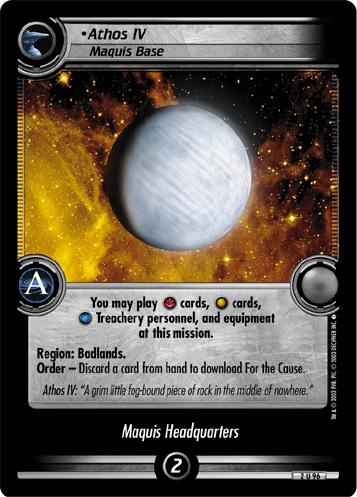 Among the Star Trek CCG affiliations, the Bajorans are the best at retrieving cards, especially personnel cards, from the discard pile; see The Prophets' Guidance for one example. The Bajorans can also make excellent use of cards in the discard pile without actually retrieving them. For example, the interrupt Ties of Blood and Water allows your Bajoran personnel who is facing a dilemma to access the skills of another Bajoran who is in your discard pile. Cardassia Prime (Hardscrabble World). Cardassia Prime is an uncommon card from the Second Edition Premiere set. 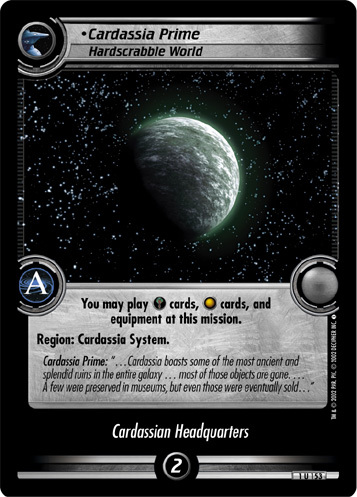 You may play Cardassian cards, Non-Aligned cards, and equipment cards at Cardassia Prime. Above all, the Cardassians' strengths lie in capturing and manipulating enemy personnel. Arrest Order, Ensnared and similar cards make it easy for a Cardassian player to capture an opponent's personnel through combat or by meeting skill requirements. Once you have a captive, you can score points using cards like Labor Camp (10 points per turn, under the right conditions) and Prison Compound (the number of points equals the number of red skill dot icons on your captives, rounded off to the nearest multiple of 5.) You can also exploit your captives' abilities to make life harder for your opponent; your personnel can employ Psychological Pressure to force your opponent to discard a card from hand whenever he or she wants his or her other personnel to use any skill that one of your captives also has. The Cardassians' other claim to fame, or perhaps infamy, is their rapacious use of natural resources - including people. For example, the Cardassian Protectorate event allows you to draw two cards per counter instead of one, as long as you are willing to give up a third card to pay for the increased drawing power. Interrupts like Comfort Women help your Cardassians gain skills from non-Cardassians (read: exploited populations). With a card like High Command "Motivation", you can even kill your own personnel in order to spend additional counters during the Play and Draw Cards segment of your turn.